There are 18 reviews of Grain de Plaisir. 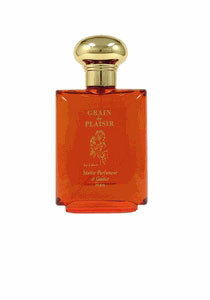 Grain de Plaisir arrives in a resounding blast of citrus and celery seed. There’s also something vaguely sweet and vegetal underneath, and it’s all very discordant. A dense nutty/doughy accord emerges after a few minutes, while the sharp celery smoothes over and integrates with the tart, chirpy citrus. A dark burnt sugar note and a bit of amber work their way out of the background while the citrus slowly fades and the doughy accord sweetens. The remaining citrus note is still discordant, and grows outright sour as it recedes. What remains is a dark, honeyed amber accord that somehow reminds me of burnt pastry, perhaps baklava. It seems to me that Serge Lutens’s Mandarine-Mandarin dries down in a similar direction, though with more finesse and complexity. Grain de Plaisier tries (maybe a bit too hard?) to be interesting, but never fully manages to pull itself together. I was really looking forward to this one. I'm an avid fan of niche novelty scents like Piment Brulant and I Love Les Carrottes and I enjoy the celery notes in Yatagan and others, so I had high hopes. First sniff: Lemonheads candy. ** sigh ** So I lowered my expectations - this is going to be one of those dated chypres that gets the citrus wrong... Then, just a hint of licorice underneath. After a while, we left the candy store as the sweetness burned off, leaving the smell of those citronella coils you burn to scare away bugs. Finally, the celery came through, but it was the dank smell of celery boiled beyond recognition, harshly over-salted and over-cooked into a shapeless grey/green mush with all of the vibrancy and life force long since burned away and replaced with fusty, dated-smelling bergamot. Given time, a subtle geranium came in, another note that I usually enjoy used here as an unappealing source of dankness. I can enjoy a good, old-fashioned chypre, but some of them seem to wallow in their own dank and just get everything wrong. Grain de Plaisir is that dank kind, and it so perfectly highlights everything about that style that I find vaguely unpleasant that I find it just gross. That being said, despite my thumbs down review and the fact that I really haven't enjoyed Grain de Plaisir, I'll happily take unpleasant historical weirdness like this over MPG's silly fruity florals. I might not like it, but at least it's clever and interesting. One of my all time favorites. Great opening and nice staying power. Don't quite understand why this one has not gotten more reviews, be it negative or positive. It's not your everyday scent but it makes me feel good. Grain De Plaisir is pretty bizarre indeed. It's all about lemon and celery with herbal and woody undertones. Very aromatic, somehow compelling but maybe a bit too odd. This is the kind of fragrance that smells good (well, sort of) but I would never feel comfortable to wear. Let me put it simple, would you wear your celery salad in pinzimonio? Maitre Parfumeur et Gantier was formed in 1988 Jean Laporte, after his stint at L'Artisan. M. Laporte's vision for MPG was to create a line that hearkened back to Paris of the 17th century. These scents almost all have that sense of being from another time. Grain de Plaisir was one of the last scents M. Laporte designed before turning over the reins at MPG to Jean-Paul Millet Lage. Grain de Plaisir feels like a blast of freshness that one could belive being worn by a male courtier of the 17th century. The top of Grain de Plaisir is the most amazing citrus herbal mix. It is mostly lemon but I also detect some grapefruit along with a very green note which according to the note list is celery seed. This is the bite of lemon with a blend of green that is beautiful. The top of this lasts for an amazingly long time on me, which is unusual for citrus scents but this top is still in control on my skin two hours after application. Since the top is the best part of this scent, this duration is a good thing. The descent in to the heart begins with an almost minty pine accord which mixes with the remains of the citrus and celery quite nicely. The base is a sweet amber which is nice contrast to the tart beginning. Grain de Plaisir translates as a "moment of pleasure". For me this is much more than a moment of pleasure and the top notes of this are spectacular. There are no member images of Grain de Plaisir yet. Why not be the first?